The prices listed are Suggested Retail. Most of the links lead to bottle prices that are significantly cheaper: your reward for reading this. The pretty floral notes are so strong that it reminds me of Muscat, and might appeal to the many fans of that grape. Viognier's characteristic apple fruit comes in on the finish. It would be nice to pour for friends with appetizers. Unusually, this spent six months in acacia wood. 90 points. 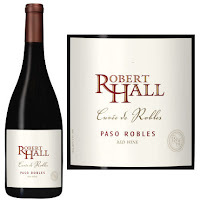 A big body, dark fruit, and good complexity: the archetypal Paso red Rhone blend. There are just enough tannins on the finish to keep it from being too soft. A blend of Grenache (43%) with Cinsault, Syrah and Petite Sirah. One of the lowest priced wines in the tasting (the link has bottles under $15), so it's good value. 90 points. I liked this wine a lot when I first tasted it: nice blueberry fruit and some minerality on the finish. It's very big and rich, and a glass would go a long way. It's based on Zinfandel blended with five other grapes (Syrah, Cabernet Sauvignon, Grenache, Petit Verdot and Petite Sirah). Given the packaging, it probably has RS, but didn't taste sweet to me. 90 points. Chef Gray, the pasta main was indeed tasty. I appreciate your reviews, especially when they include affordable wines that earn high scores. You mentioned that the Peachy Canyon "Clevenger" zinfandel is "a reminder of the way Zin used to be". I assume that recent zinfandels are characterized by overripeness and heat from high alcohol. What are the most significant ways that zinfandel has changed over the years? Are there notable wineries besides Peachy Canyon that still make zins in the old style? Ridge perhaps? The Hendry bottlings were "classic" in style: ripe, rich, aromatically pleasing . . . without the stewed fruit/pruney character, and none of the "heat" from excessive levels of alcohol. Bob, thank you for the information. I just ordered a few bottles of the Hendry Blocks 7 & 22 Zinfandel and am looking forward to trying it. Blake, I found your 2005 SF Chronicle article on old vine zinfandels. It seems that the most common descriptions used in the tasting notes back then were graphite, raspberry, pepper, licorice, plum, spice/spicy, currant, and blackberry. Is that still the case with more recent zins? Guren, wow, that article is a Golden Oldie! I only find the non-fruit flavors on that list of descriptors in old vine Zins made in a restrained style, and I'll be honest, I haven't been drinking as much Zinfandel over the last few years because my expectations were lowered. Also, California Pinot Noir has come a long, long way since 2005 and now takes up a large enough percentage of my dinner wines to have taken away some Zin opportunities. But I have had enough good Zins to know they're still out there. Maybe I need to do another big Zin tasting article. For this one, the bollixed nature of it meant I didn't actually taste very many.